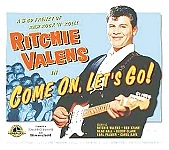 In Music We Trust - Ritchie Valens: Come On, Let's Go! Can you believe that in a mere eight month period during the late 1950's one single eighteen-year-old from the San Fernando Valley, armed with only a home-made guitar and a mere handful of songs, achieved what other men spend entire careers only DREAMING of accomplishing? Yessir, in less time than it now takes yer typical band to get a good drum sound together, Ritchie Valens up and fused his proud Latino heritage with an inspired new-found love for Little Richard (!! ), breezed into Los Angeles' famed Gold Star studios, laid a few tracks down, went out on the road, got on TV, appeared in a movie, became a bonafide rock star himself --then perished alongside his new pal Buddy Holly on that cold day the music supposedly died in 1959. Why then, over four decades later, should you rush out and buy this fantastic 3-CD set comprising of most every single note the Boy Wonder ever recorded? Because, as much as you should already know, love and admire "Donna" and the monumental "La Bamba" (two of only four songs released during Valens' entire lifetime! ), listening now to the out-takes, jams and even "In Concert At Pacoima Junior High" recordings herein reveals not only the obvious blueprints for Jose Feliciano and Los Lobos' future careers, to name but two, but hitherto unimaginable evidence of no less than the birth of garage, punk, and even surf-rock sounds to come. Who'd have ever thought?!! Nope, me neither.